Harms works at SANAE IV, the South African Antarctic research station in coastal Dronning Maud Land just inside the Antarctic Circle. The base itself is located on top of a distinctive flat-topped nunatak, which offers observers a fine view of the sky. The view could remain colorful for some days to come as the solar wiind continues to blow. Stay tuned! 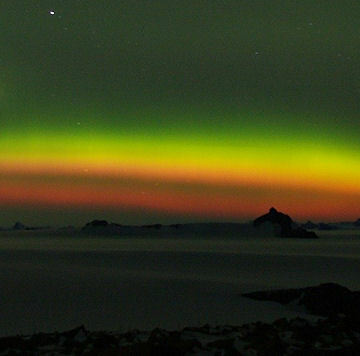 Posted on April 8, 2010, in antarctica, research and tagged antarctica, solar storm. Bookmark the permalink. Leave a comment.